Driving to Alaska is an essential roadtrip. Like Kerouac in his famous beat generation novel, “On the Road”, life is about the journey itself. 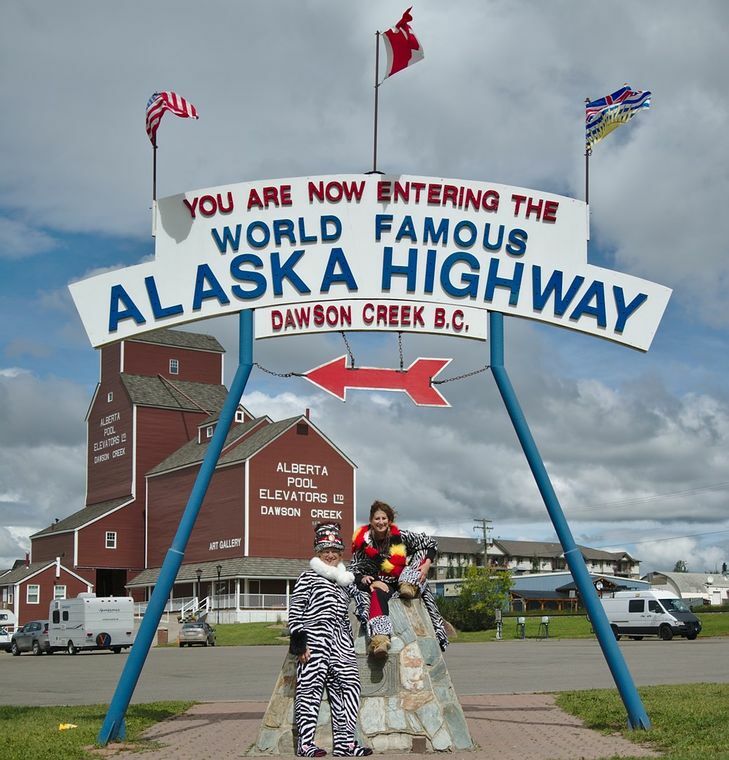 So at Mile Zero of the Alaska Highway in Dawson Creek, British Columbia, Canada, we felt it was important to represent our culture by wearing costumes for the requisite photo-op. After all, what is an epic journey without a zebra onesey? 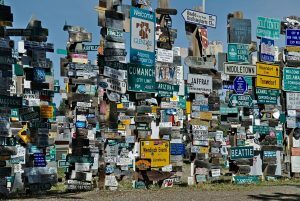 The Alaska Highway (aka, the Al-Can Highway) would probably never exist if Japan had not attacked Pearl Harbor. The Highway was primarily motivated (and paid for) by the defensive plans of the United States. After the war, the U.S.A. dumped, er, turned over the highway to Canada, who never really saw much economic benefit to it all. Nevertheless, after 40 or 50 years they had paved their entire section. The road is a lovely mosaic of crystal rivers, lakes, forests and stoic mountains. 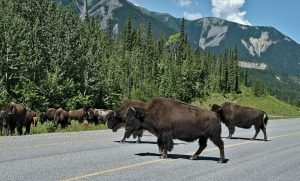 We were interrupted by goats or bison crossings, and the occasional bear at the edge of the forest. At times, the road evokes the dull ennui of unbroken spruce walls. 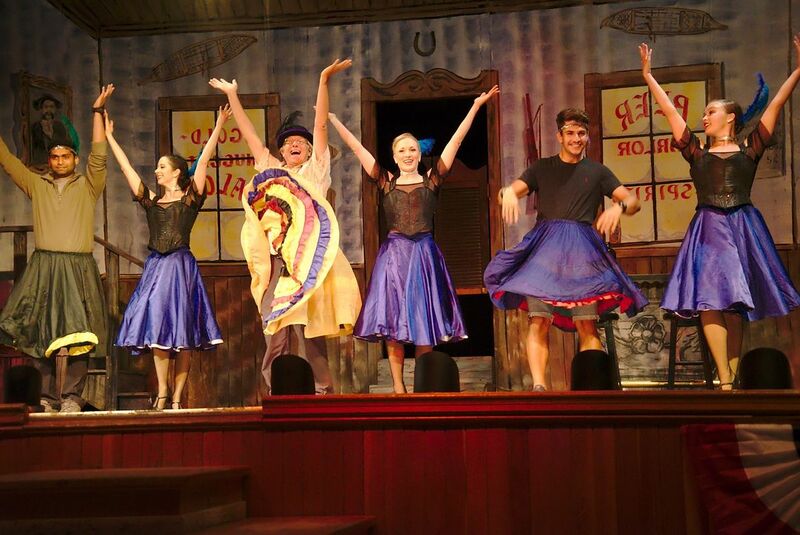 In between, were delightful gifts like Watson Lake. Besides the amazing “sign post forest” for which we were under-equipped (alas! ), the morning coffee shop had pretty good coffee and a decent omelet. At the town community center, we enjoyed an empty fitness center, sauna, hot showers, and towels for a mere $5 Canadian each. 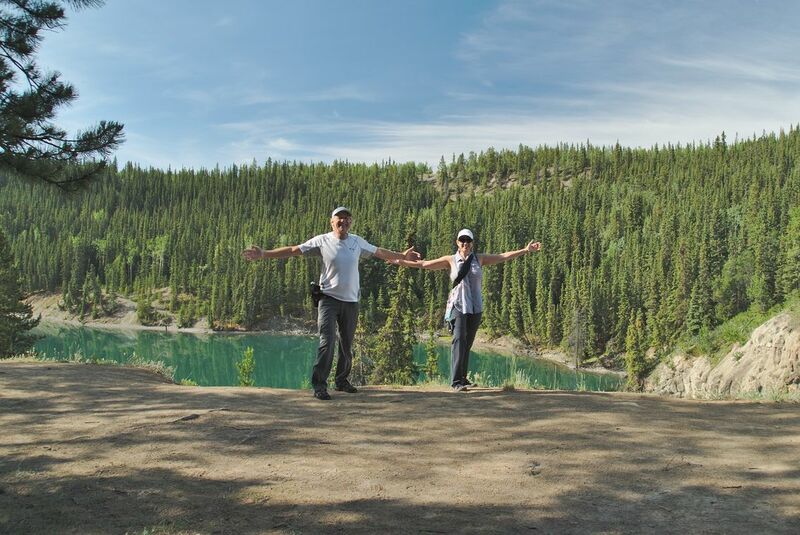 The hot springs of Liard River were a delightful interlude. 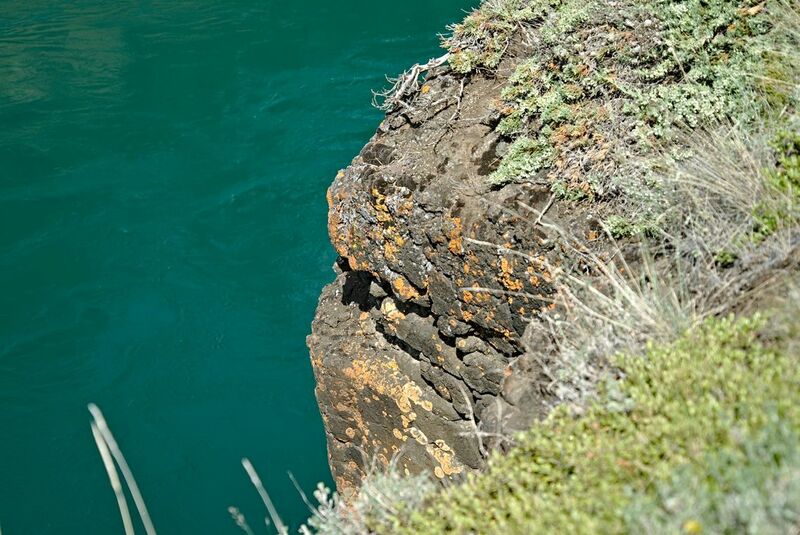 It is an actual hot river instead of the more prosaic man-made pool fed by springs. 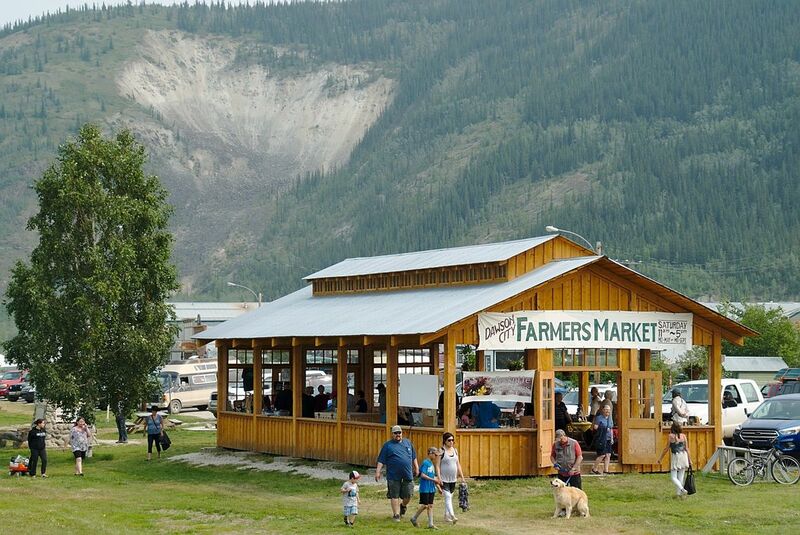 The area is a Provincial park that is not commercialized, with just the changing rooms, outhouses and boardwalks necessary to enjoy the warm river. 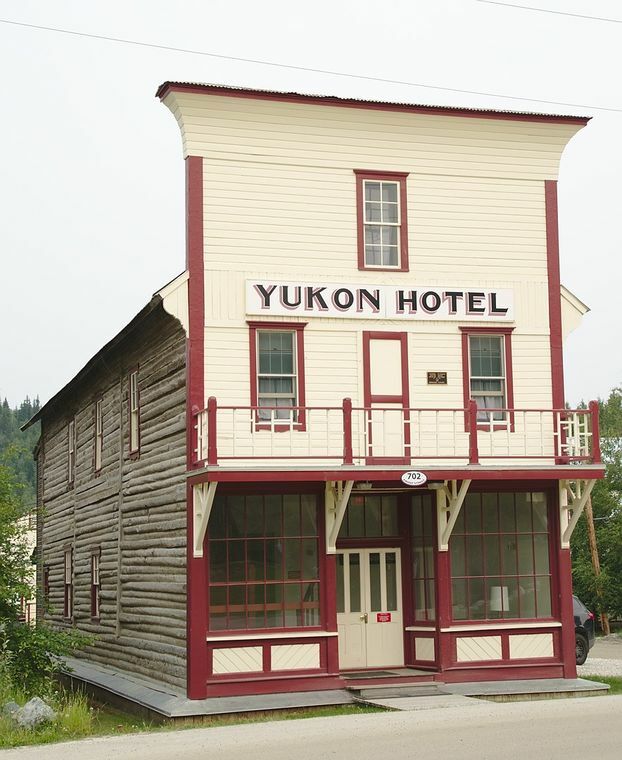 Whitehorse, the capital of the Yukon was really cool. 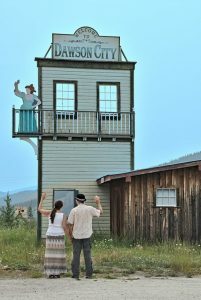 We tried to crash a dignitaries’ reception on the classic S. S. Klondike, a preserved steam-driven, paddle-wheel river boat that transported gold and supplies on the Yukon River until the 1950s. Unfortunately, we were too late for the cocktails. I hate that. 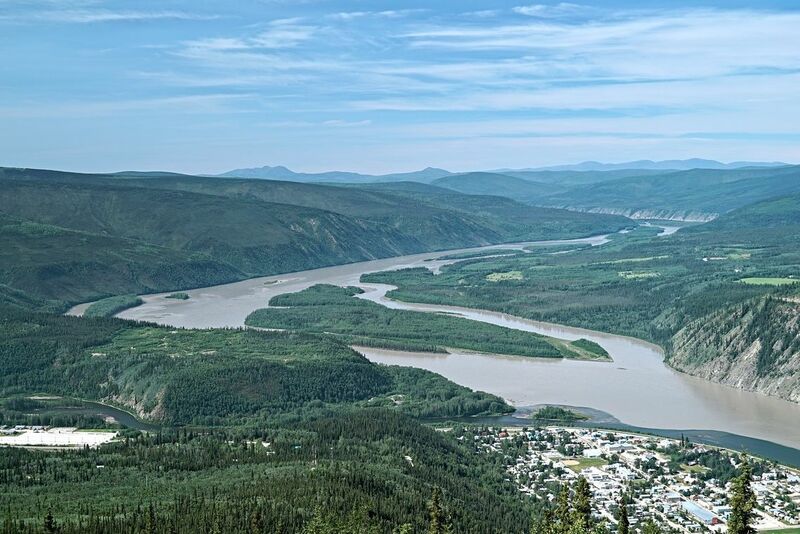 Whitehorse is where the classic Alaska Highway begins to follow the Yukon River. This is a significant and mighty river of Northwestern America. The city is just north of the river’s source. Over the nearly 2000-mile course to the Bering Sea, it’s the longest river in both Alaska and the Yukon. 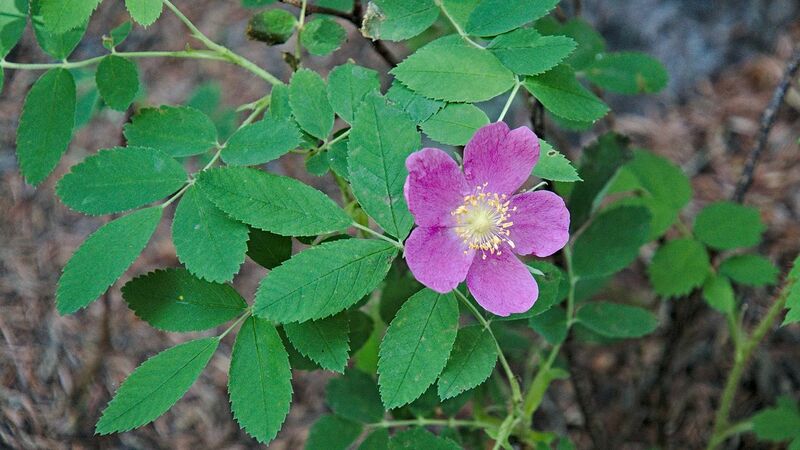 It’s claim to fame is that it was the primary transport for the Klondike Gold Rush. 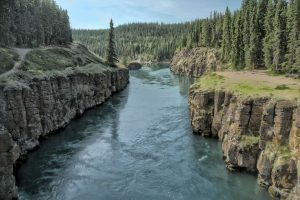 We hiked the Miles Canyon, so named because Miles was the only pilot who could safely navigate the narrows and swift water. He thus made a career of safely taking gold-dreamers downriver. 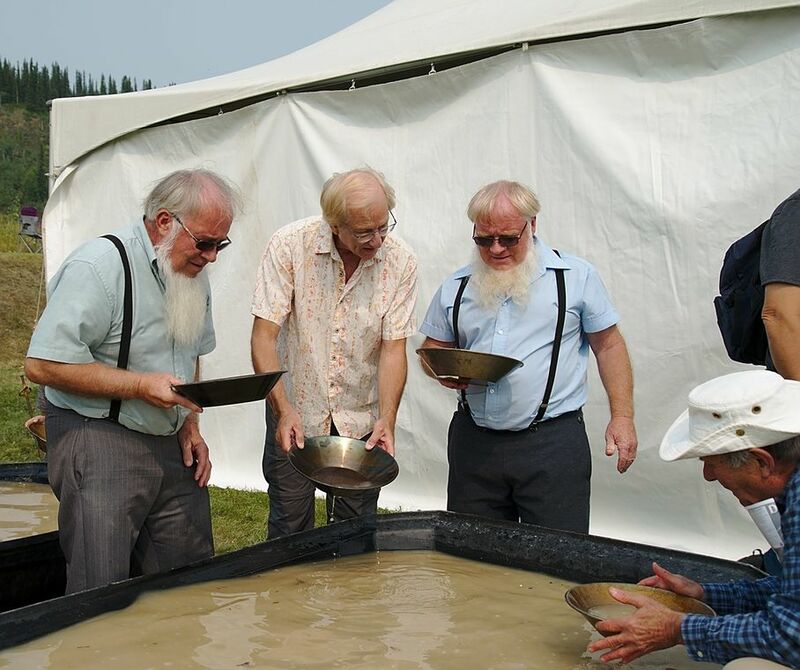 Our last stop in Canada was Dawson City which retains so much of it’s “Gold Rush” charm that Ivan was pressed to try his luck at gold panning with these two crusty, Amish folk. Obviously, we didn’t strike it rich or we’d be writing a different blog! 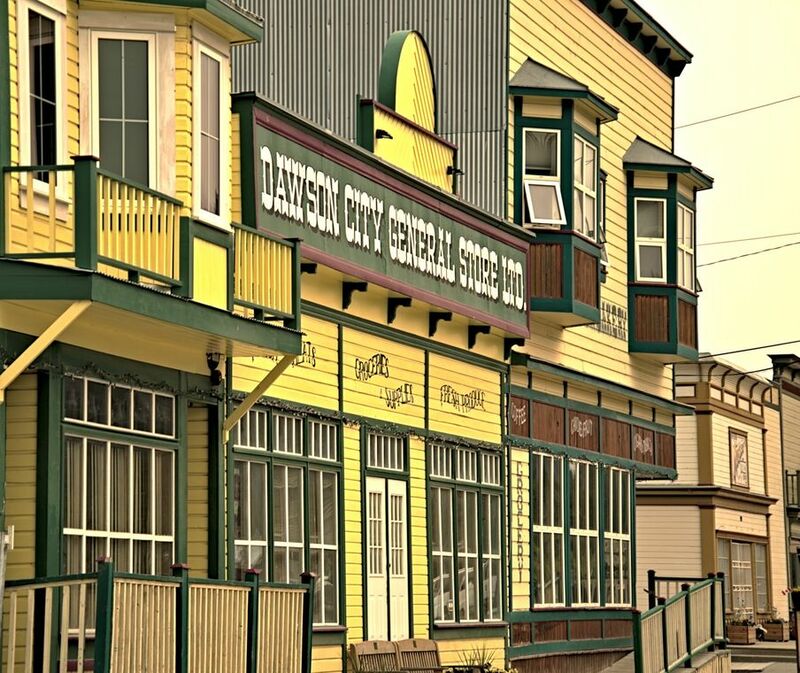 Dawson City was the center of the Klondike Gold Rush of 1896, and was popularized by author Jack London in “The Call of the Wild.” Walking around amongst the restored building facades has an almost Disney-esque, magical quality. Failing at panning gold, Ivan had better luck joining the chorus line at Diamond-Tooth Gertie’s Saloon and Gambling Hall. 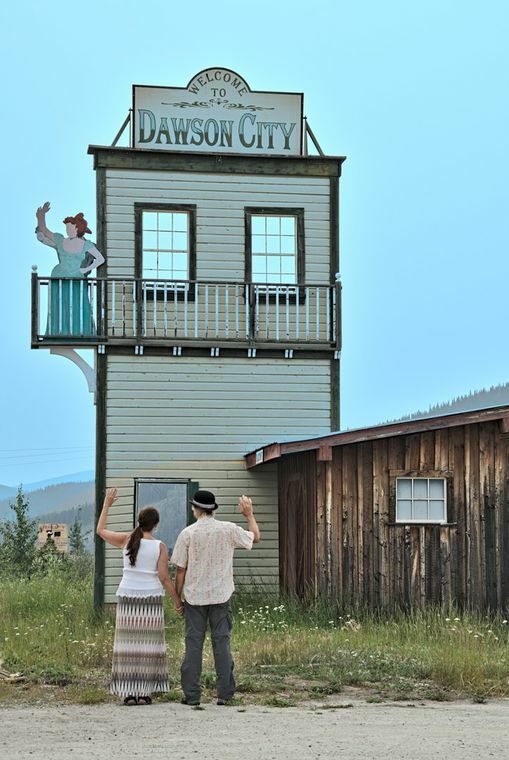 We intended to take the “Top of the World Highway” from Dawson City to Chicken, Alaska. This is an unkempt, narrow road with no guard rails and deadly, 1000-foot drops on hair-pin turns. Sounds like fun, right? Checking the weather, though, we discovered “wind advisories” with gusts to 55 miles per hour. A braver man may have taken the high side-profile Sprinter over that stretch, but not us. We chickened out going to Chicken. 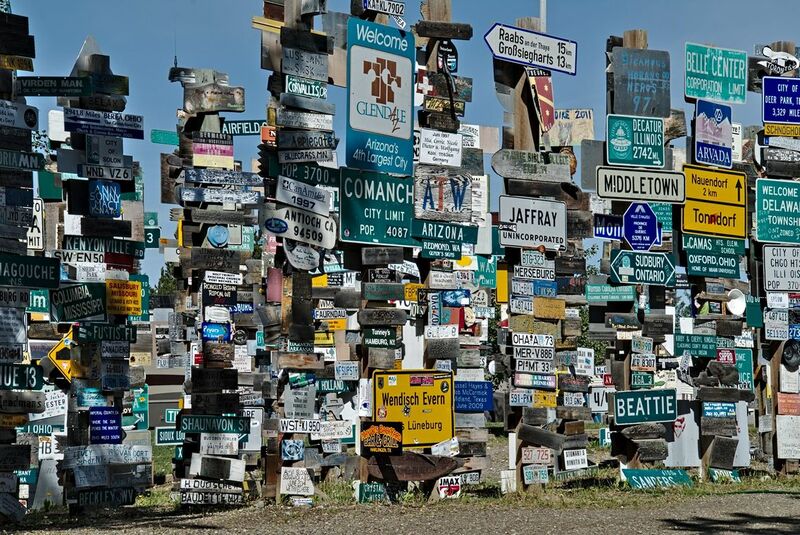 Instead, we doubled back to Whitehorse and followed the official Alaska Highway path westward. 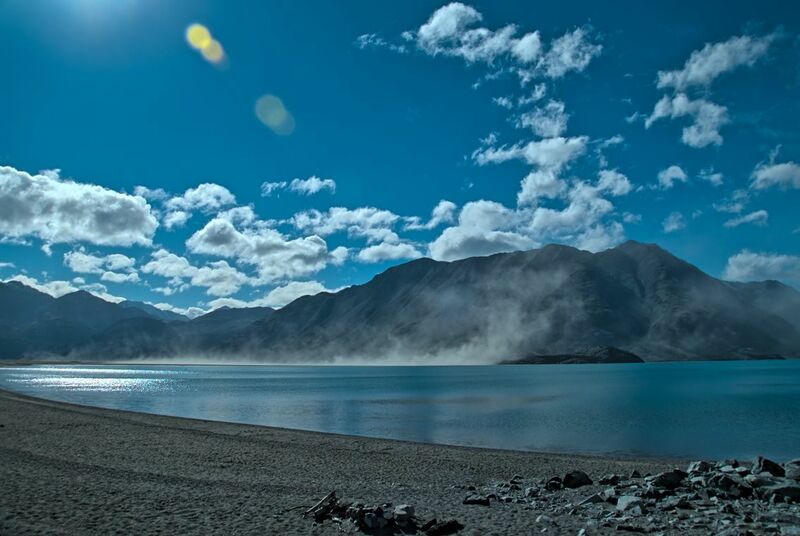 On the way, we pulled over to make a late dinner on the beach of Kluane Lake. The midnight sun was still high in the sky. With Congress, every time they make a joke it’s a law; and every time they make a law it’s a joke.